We are an established organization with business operations in Puerto Rico since 1958 with deep understanding of business needs for Puerto Rico including regulations and the environment. The depth of experience and commitment ranks Peerless and its companies among the best-of-breed. Integrity defines our organization with its team of trusted employees. We are committed to service of the highest quality, and dedication to excellence while focusing on driving economic growth, development and employment in Puerto Rico. We rigorously pursue continuous process improvement and modernization. Our team has and develops a deep knowledge base and expertise, integrating and embracing corporate social responsibility into our operations. Continue to expand our petroleum based business and seek opportunities to diversify our operations. Increase local employment in Puerto Rico by reinvesting our profits and spurring economic development and growth. Identify business ventures that leverage our assets and capabilities including utilization of our land resource and existing infrastructure. Emphasize the balance between the operations and the environment, complying with all the US Federal and local regulations. We are members of various associations: Independent Liquid Terminal Association (ILTA), NPRA, PR Manufacture Association, PR Southern Chamber of Commerce, National Small Business Association (NSBA), Codezol, National Association of Foreign Trade Zones (NAFTZ), PR Products Association. Puntilla deep draft dock has a 80,000 dwt capacity, 37 ft draft. 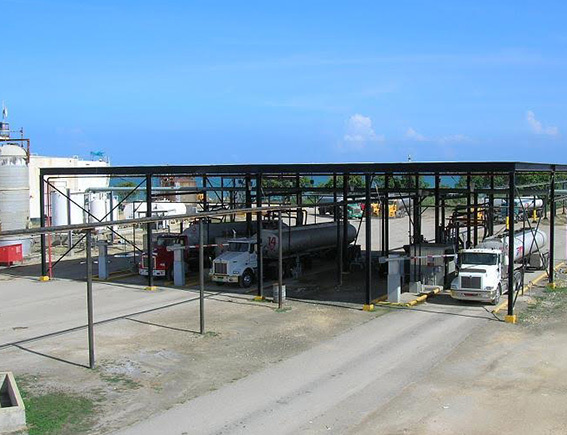 Cayo Rio dock, designed to handle large vessels up to 60,000 dwt, 40 ft draft. Guayanilla dock can support 25,000 dwt vessels, 35 ft draft. RORO dock accomodates large ocean-going barges, 20 ft draft, providing Peerless with its own floating highway into the Caribbean.